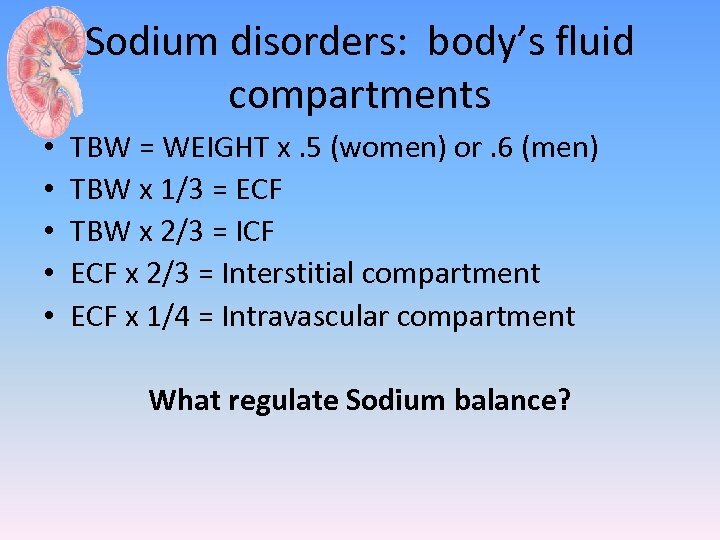 Sodium disorders: body’s fluid compartments • • • TBW = WEIGHT x. 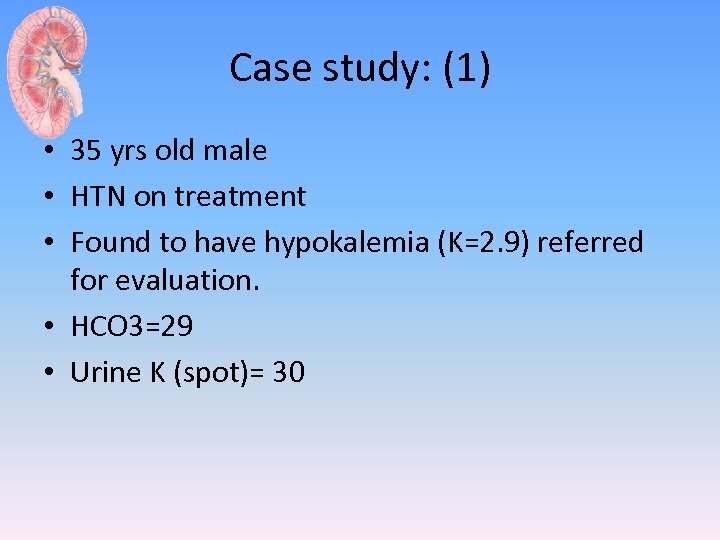 5 (women) or. 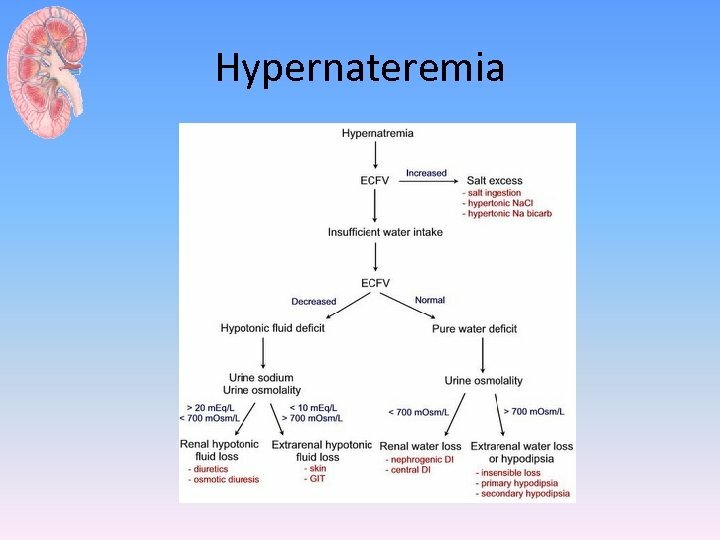 6 (men) TBW x 1/3 = ECF TBW x 2/3 = ICF ECF x 2/3 = Interstitial compartment ECF x 1/4 = Intravascular compartment What regulate Sodium balance? 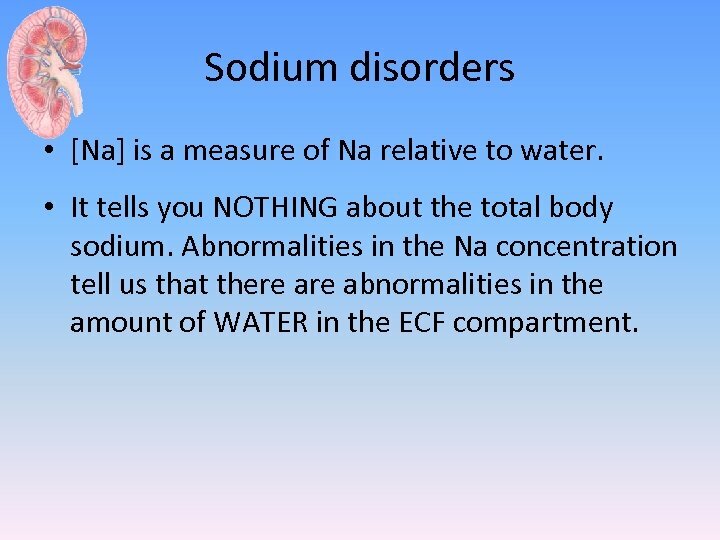 Sodium disorders • [Na] is a measure of Na relative to water. 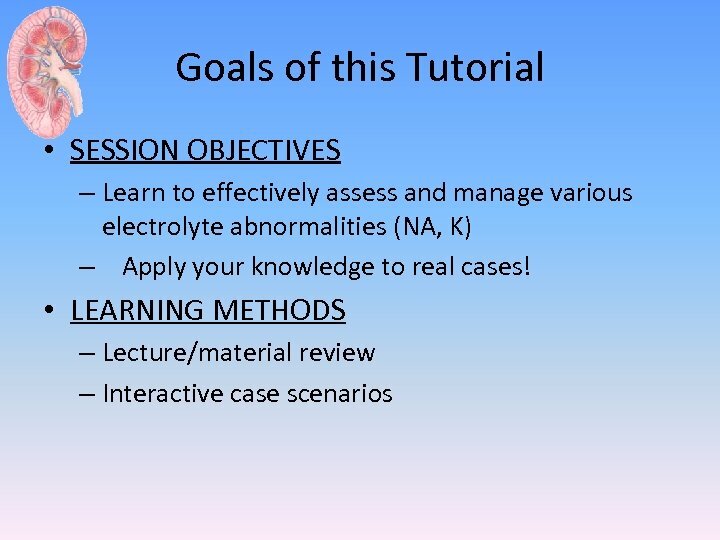 • It tells you NOTHING about the total body sodium. 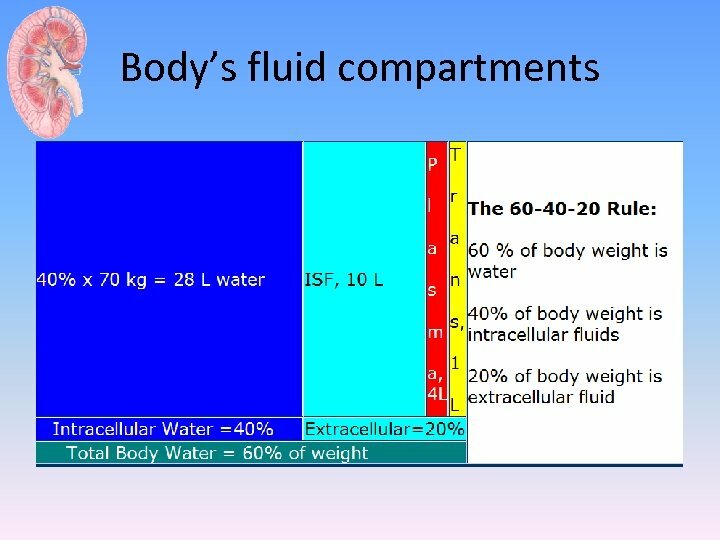 Abnormalities in the Na concentration tell us that there abnormalities in the amount of WATER in the ECF compartment. 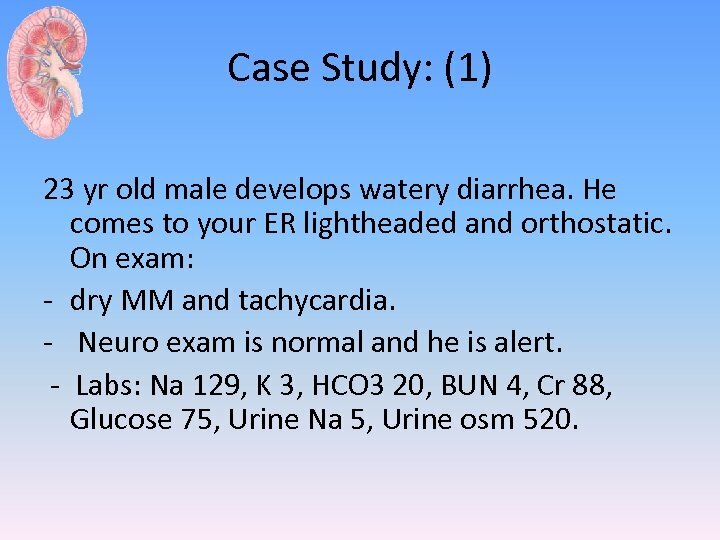 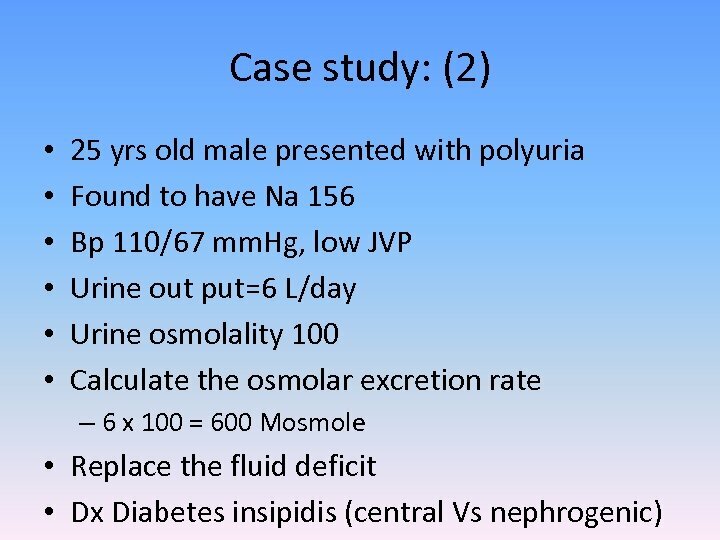 Case Study: (1) 23 yr old male develops watery diarrhea. 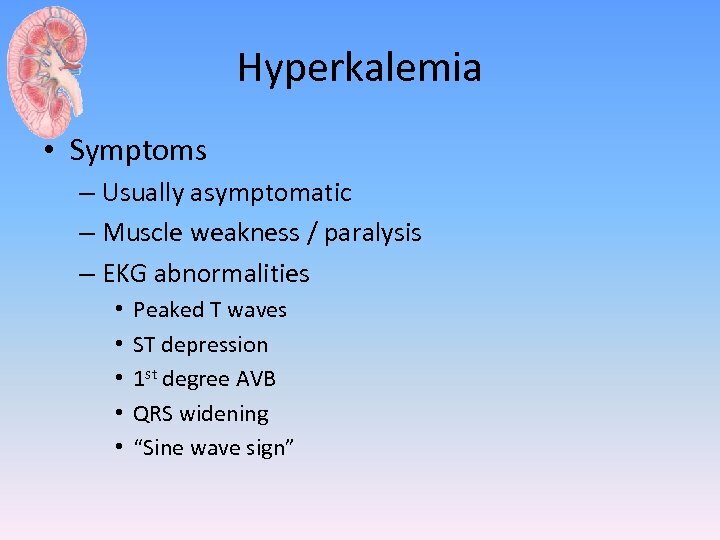 He comes to your ER lightheaded and orthostatic. 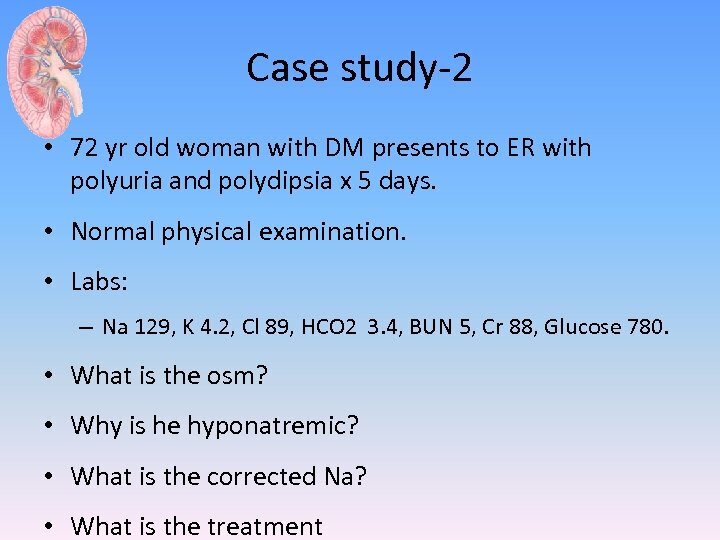 On exam: - dry MM and tachycardia. 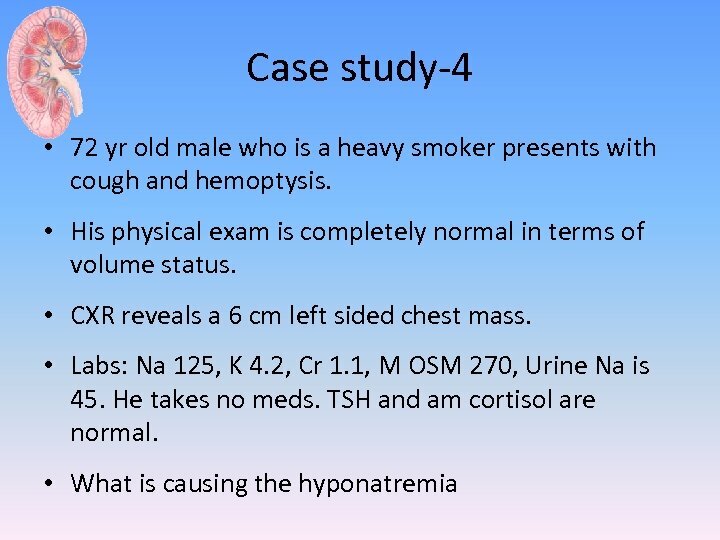 - Neuro exam is normal and he is alert. 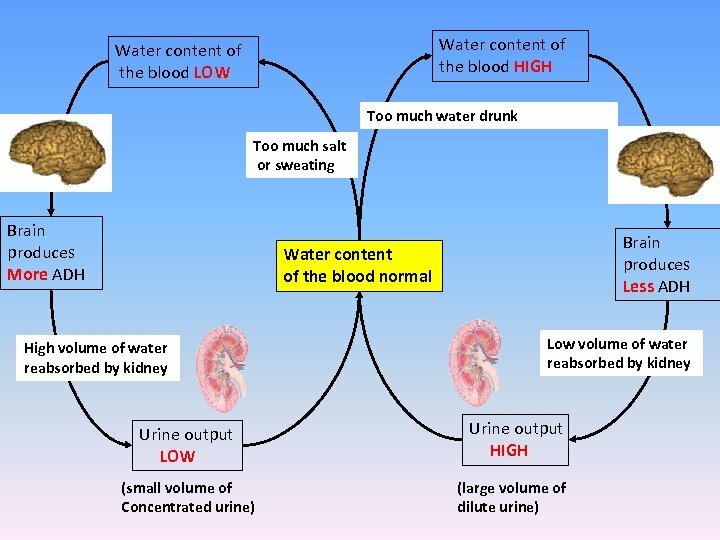 - Labs: Na 129, K 3, HCO 3 20, BUN 4, Cr 88, Glucose 75, Urine Na 5, Urine osm 520. 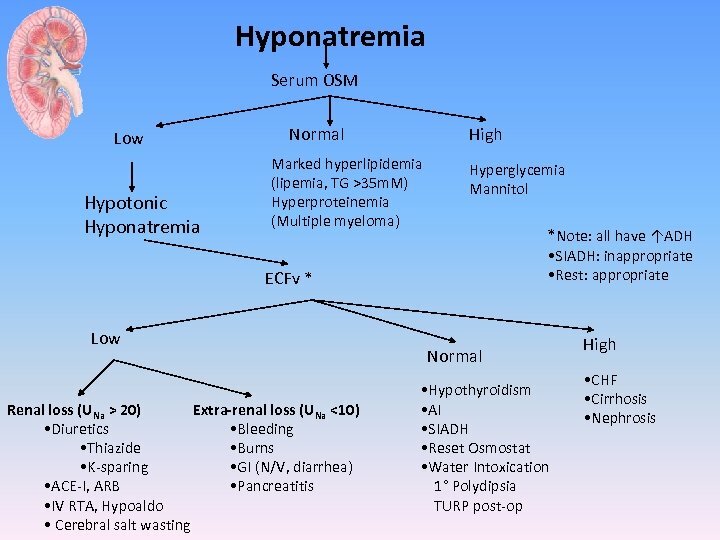 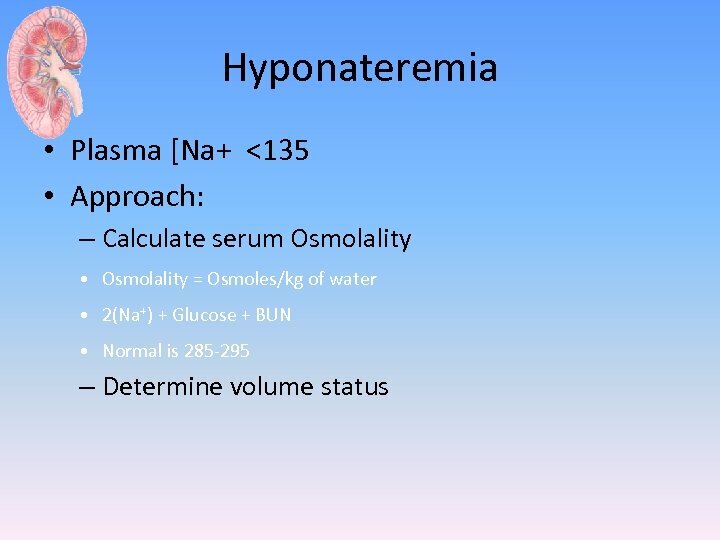 Hyponateremia • Hyponatremia with high osmolality: [Na] is low since water will flow into the ECF compartment as a result of hyperglycemia for example. 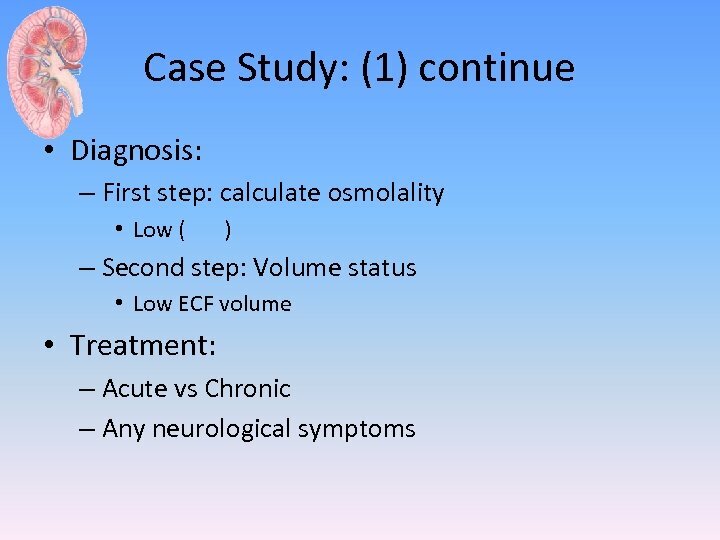 – The calculated and measured osm will be elevated in that case. 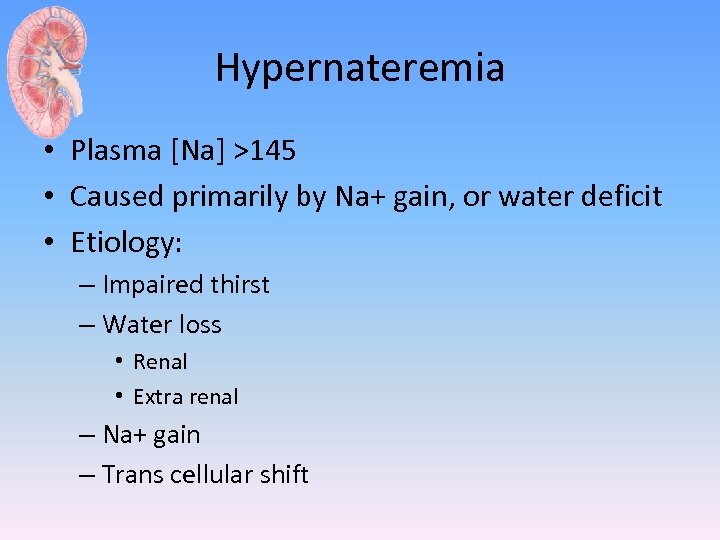 Na will decrease by approx 1. 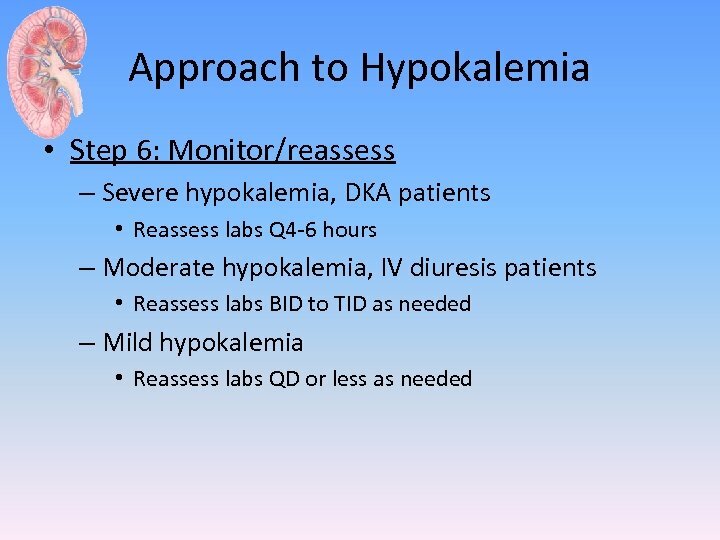 6 meq/d. 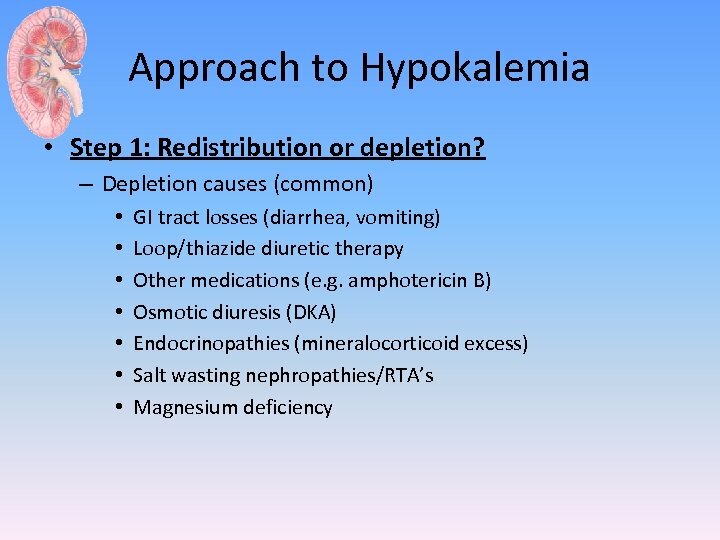 L for every 100 mg/dl increase in glucose above 100. 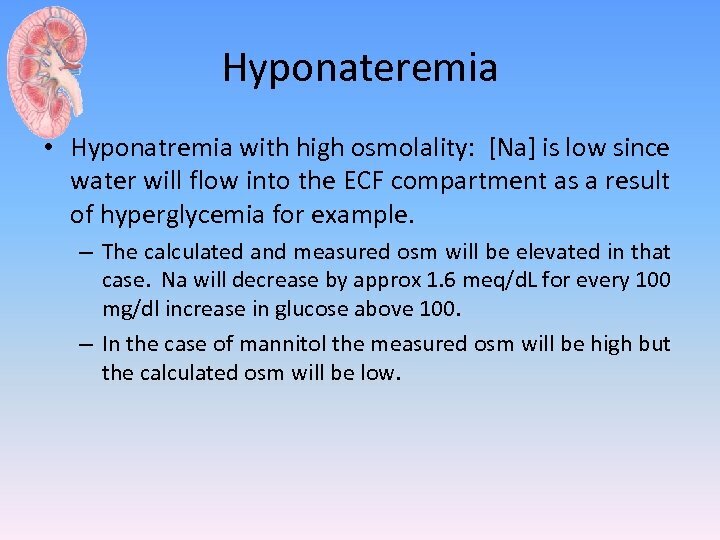 – In the case of mannitol the measured osm will be high but the calculated osm will be low. 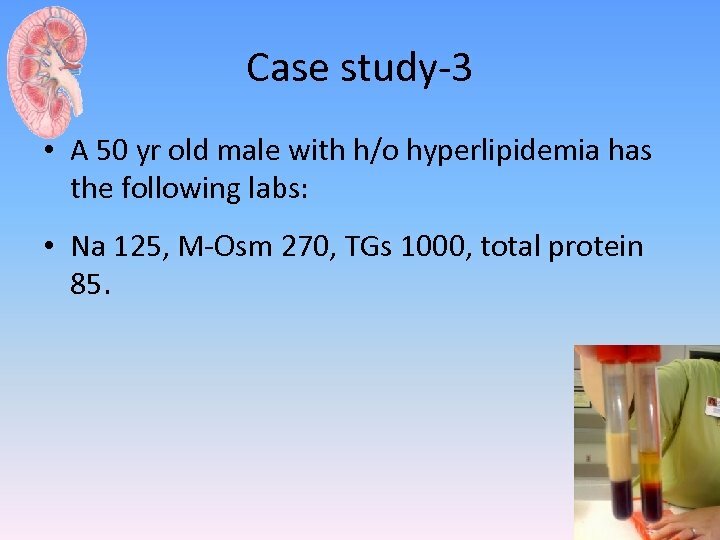 Case study-3 • A 50 yr old male with h/o hyperlipidemia has the following labs: • Na 125, M-Osm 270, TGs 1000, total protein 85. 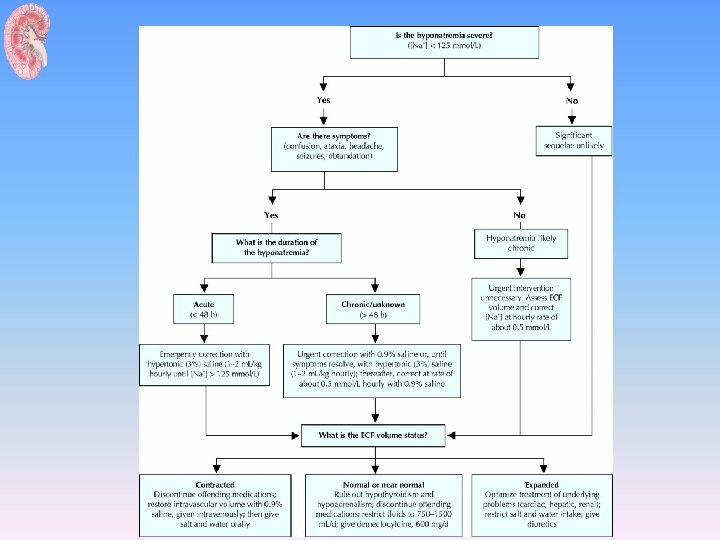 Case Study: (5) • A 72 -year-old woman presents with a 2 -day history of presyncope when rising from a chair. 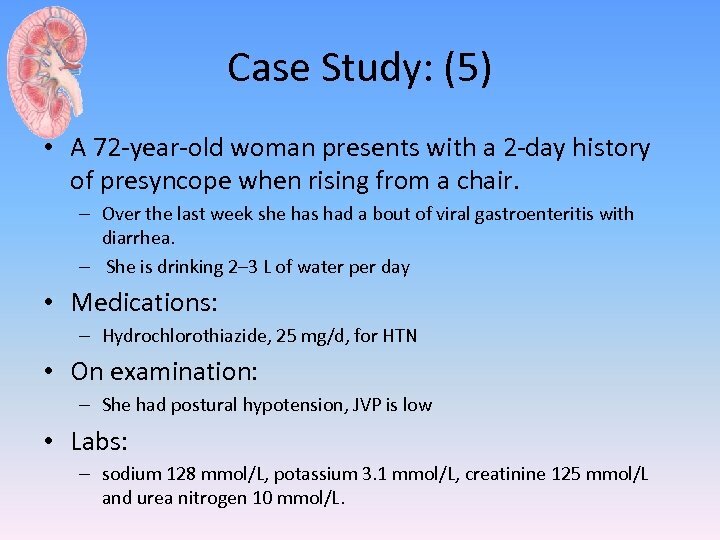 – Over the last week she has had a bout of viral gastroenteritis with diarrhea. 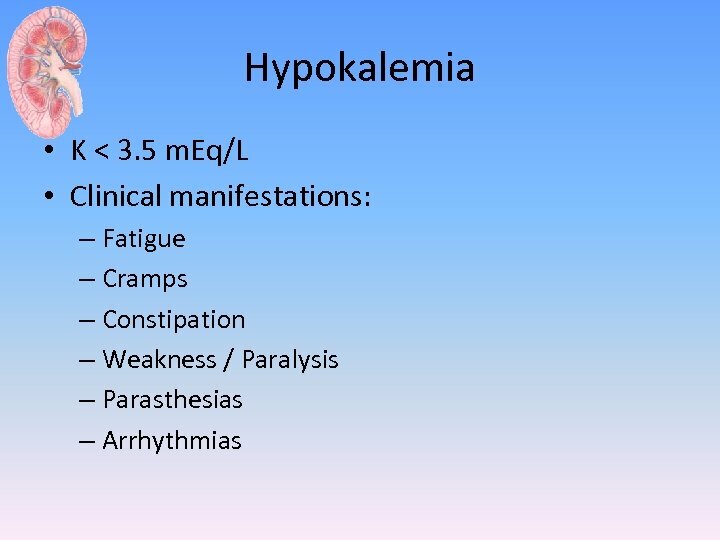 – She is drinking 2– 3 L of water per day • Medications: – Hydrochlorothiazide, 25 mg/d, for HTN • On examination: – She had postural hypotension, JVP is low • Labs: – sodium 128 mmol/L, potassium 3. 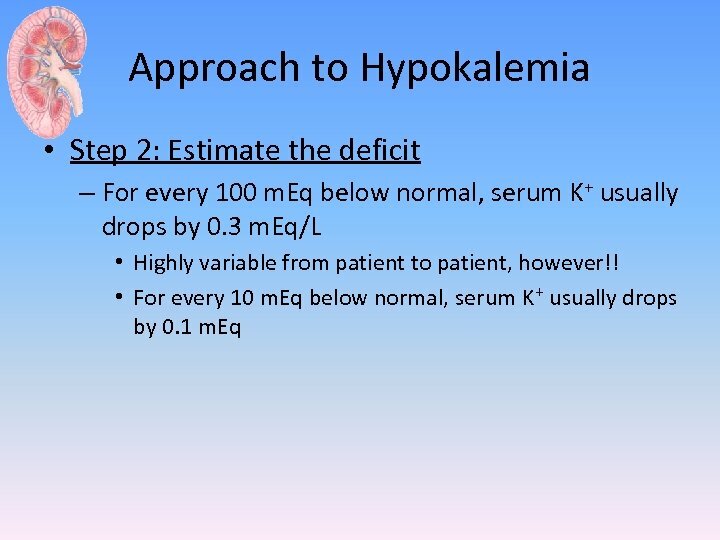 1 mmol/L, creatinine 125 mmol/L and urea nitrogen 10 mmol/L. 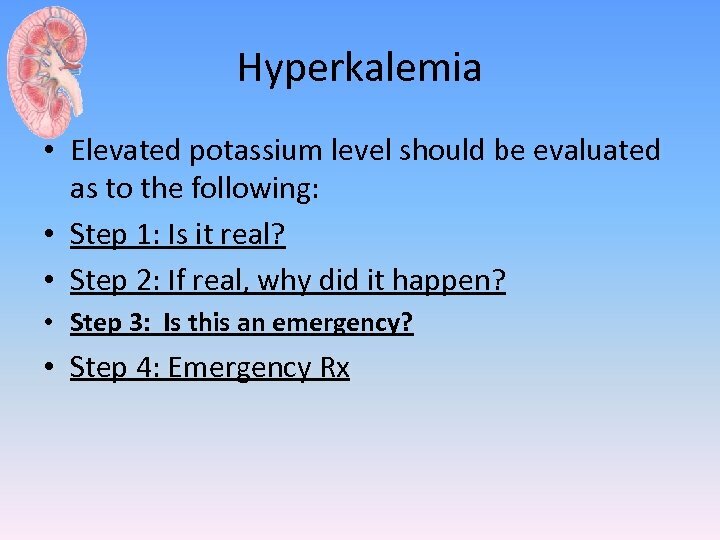 Approach to Hypokalemia • Step 5: Choose dose/timing – Mild/moderate hypokalemia • 3. 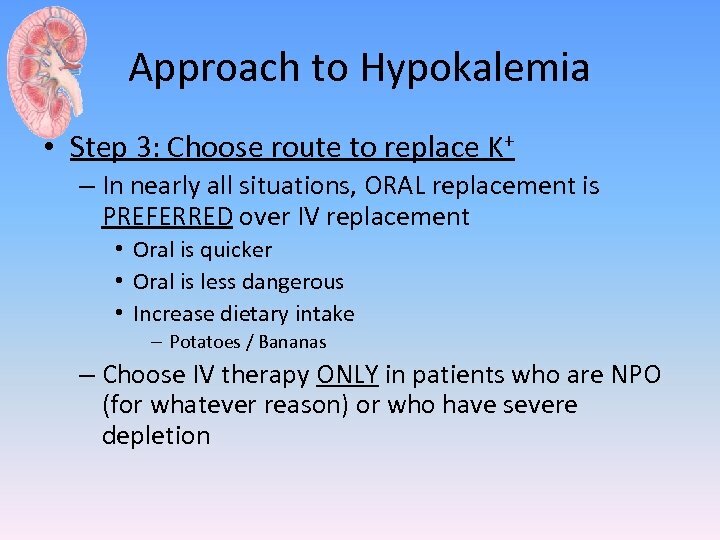 0 to 3. 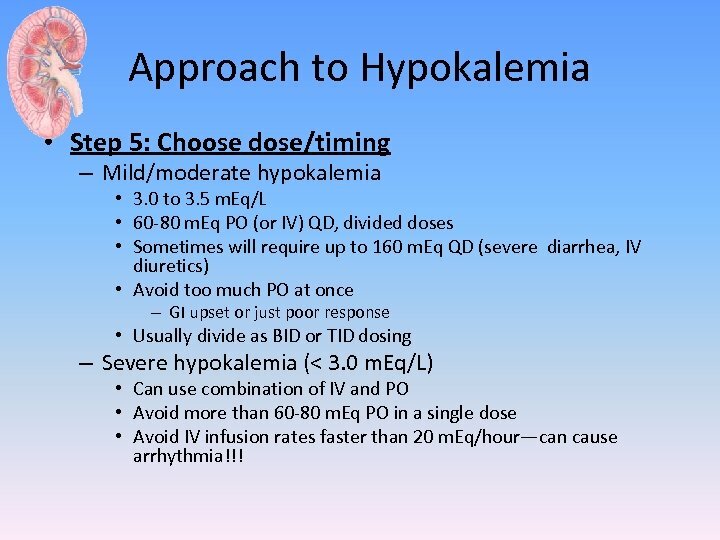 5 m. Eq/L • 60 -80 m. Eq PO (or IV) QD, divided doses • Sometimes will require up to 160 m. Eq QD (severe diarrhea, IV diuretics) • Avoid too much PO at once – GI upset or just poor response • Usually divide as BID or TID dosing – Severe hypokalemia (< 3. 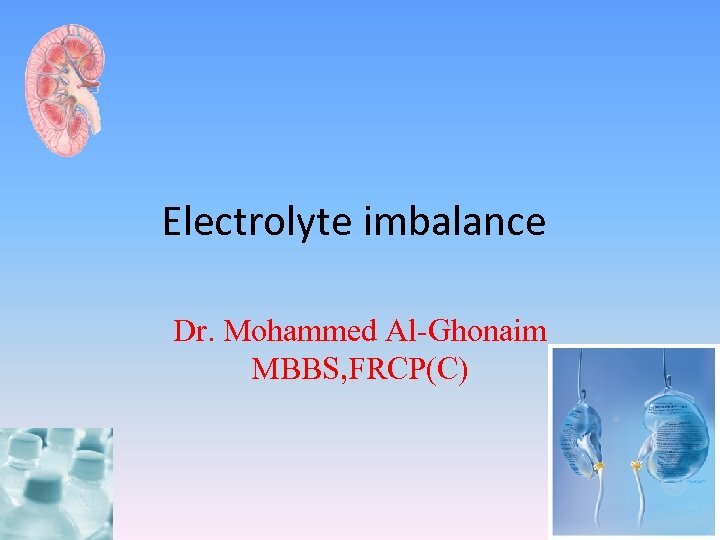 0 m. Eq/L) • Can use combination of IV and PO • Avoid more than 60 -80 m. Eq PO in a single dose • Avoid IV infusion rates faster than 20 m. Eq/hour—can cause arrhythmia!!! 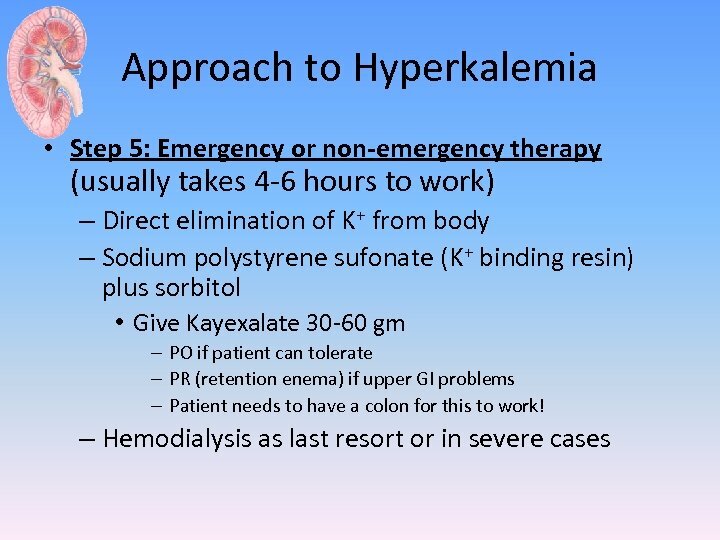 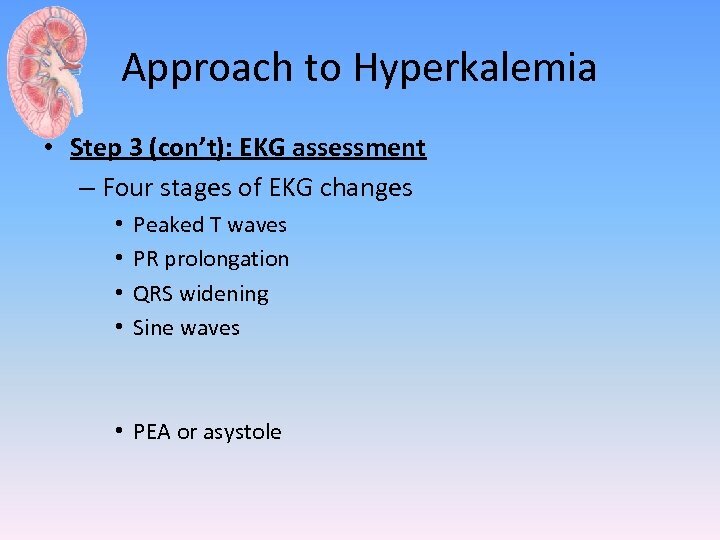 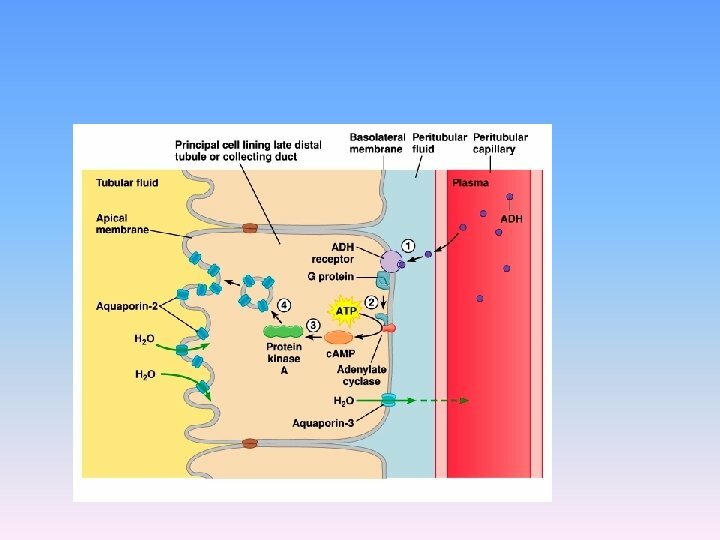 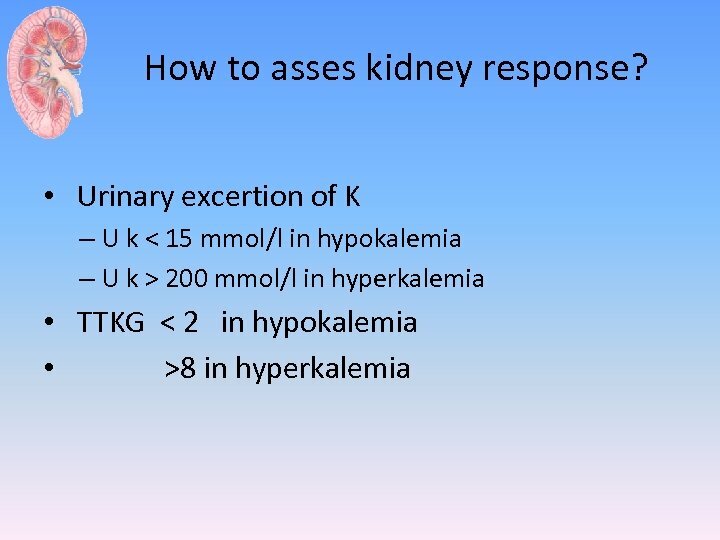 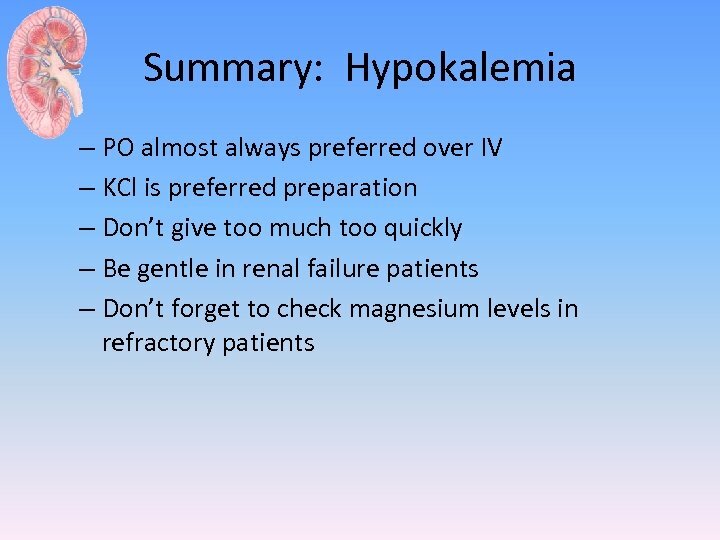 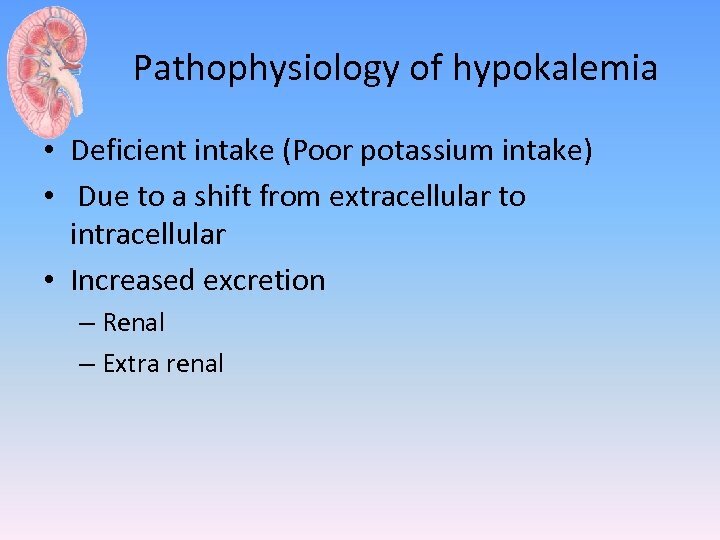 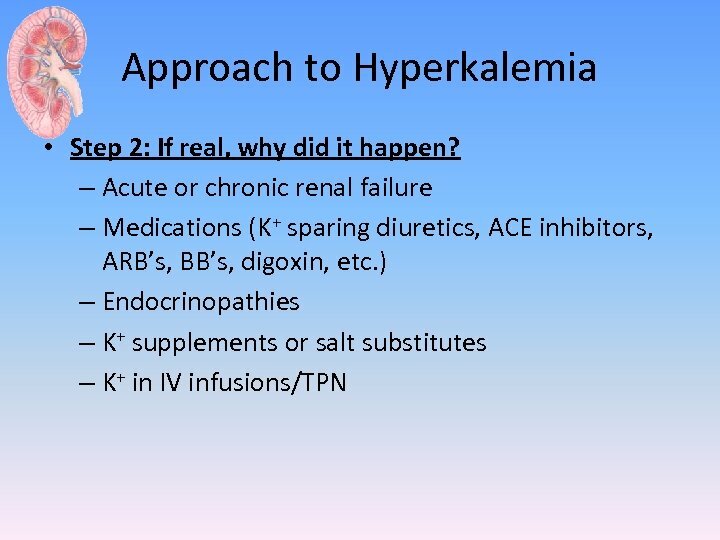 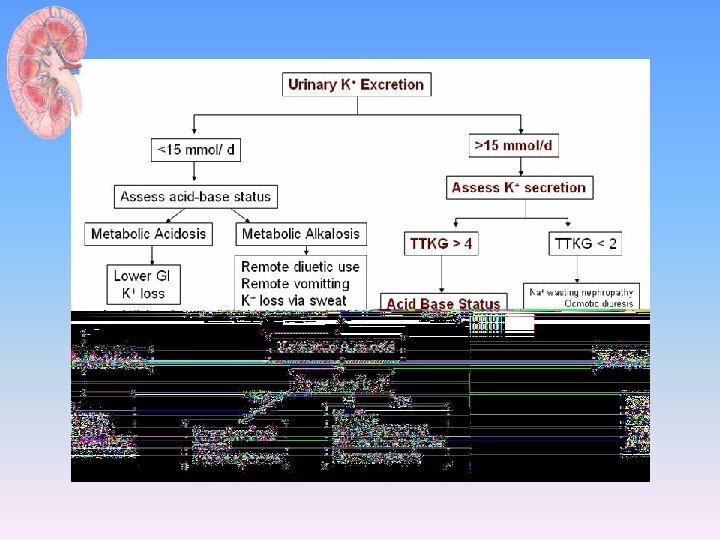 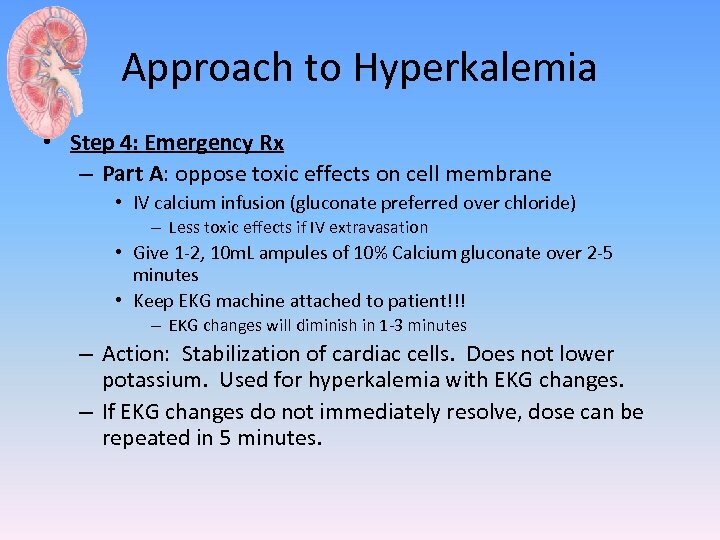 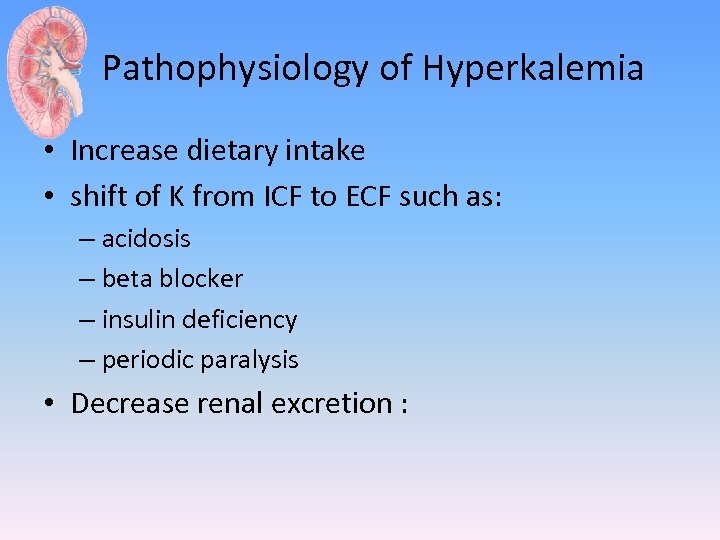 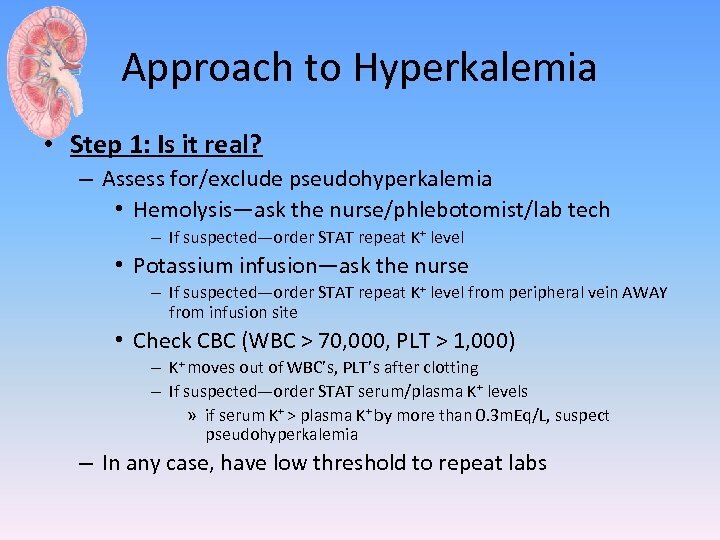 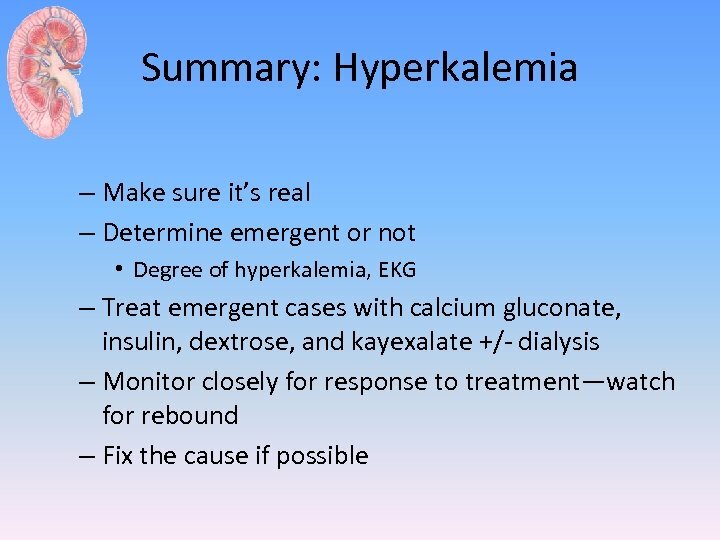 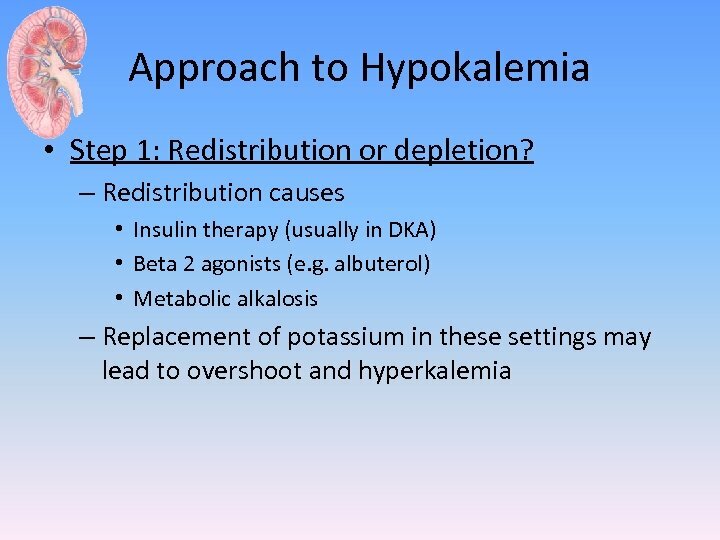 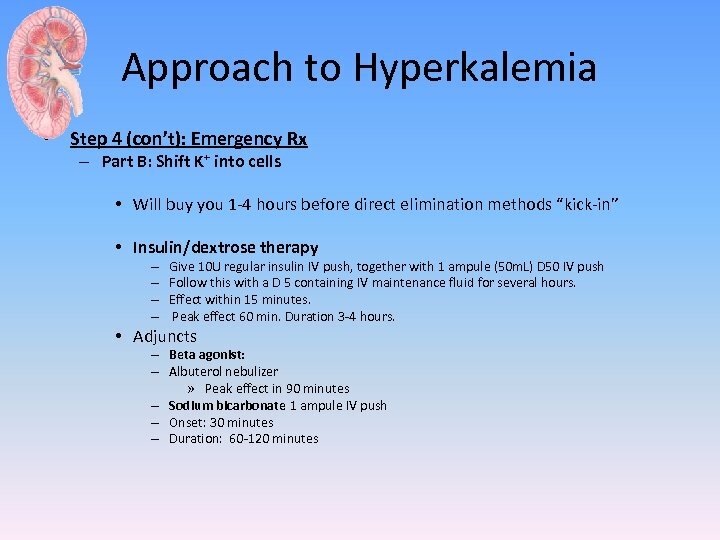 Approach to Hyperkalemia • Step 4: Emergency Rx – Part A: oppose toxic effects on cell membrane • IV calcium infusion (gluconate preferred over chloride) – Less toxic effects if IV extravasation • Give 1 -2, 10 m. L ampules of 10% Calcium gluconate over 2 -5 minutes • Keep EKG machine attached to patient!!! 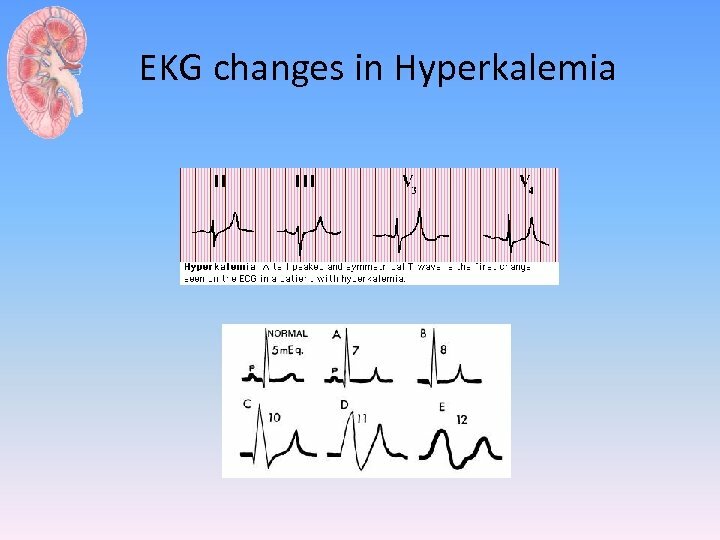 – EKG changes will diminish in 1 -3 minutes – Action: Stabilization of cardiac cells. 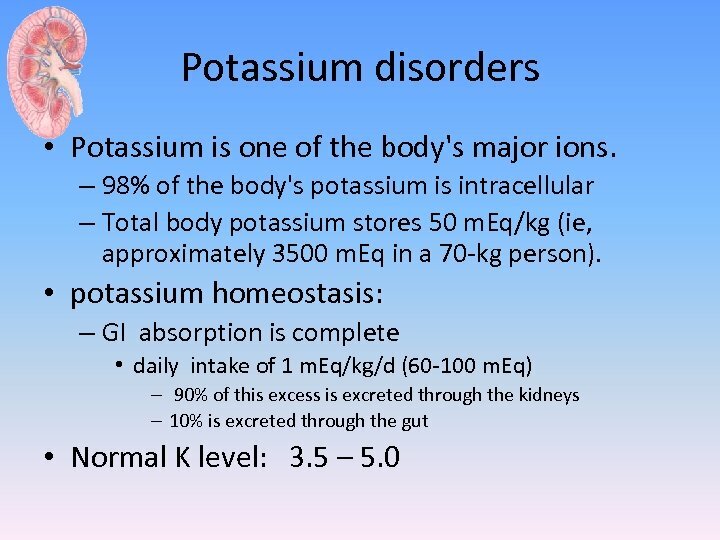 Does not lower potassium. 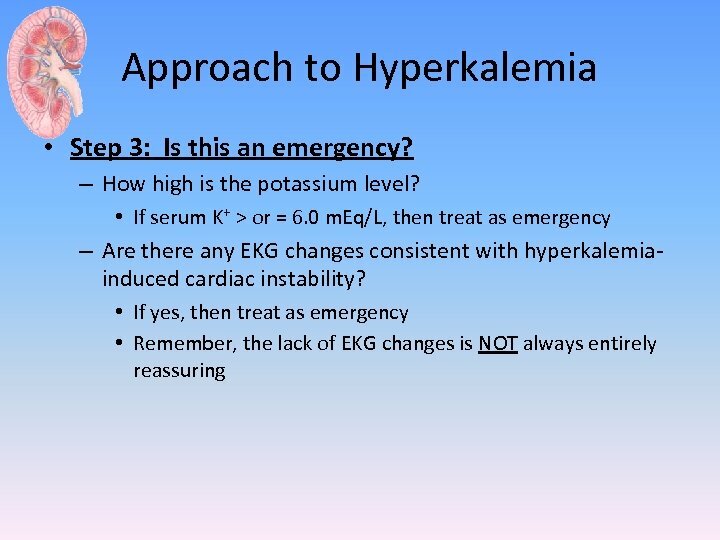 Used for hyperkalemia with EKG changes. 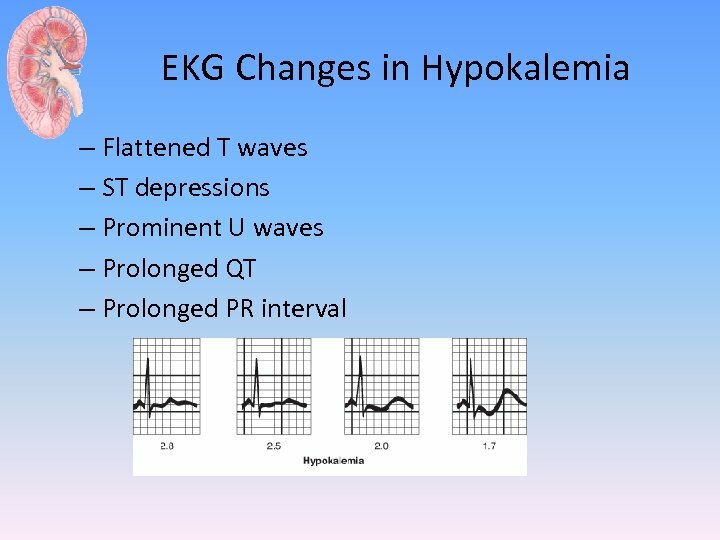 – If EKG changes do not immediately resolve, dose can be repeated in 5 minutes. 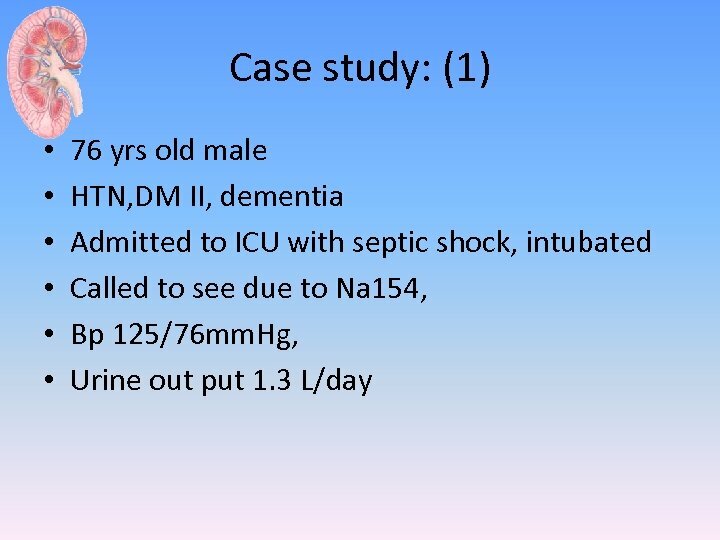 Delivering Difficult News to Families Sarojini Budden M.